Data Station Plus, Multiple Protocol Converter, Communication Gateway for PLC's, PC's and SCADA Systems. 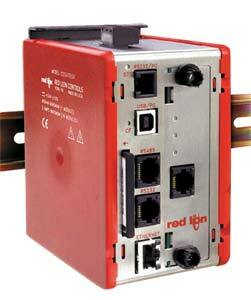 High-Speed Data Logging , Web Server and Virtual HMI. The Data Station Plus acts as a nexus for industrial data collection and management. Now features such as data logging, protocol conversion and remote machine monitoring and control can be added to any equipment. With three built-in serial ports and a 10 Base-T/100 Base-TX Ethernet port, the unit performs protocol conversion, allowing disparate devices to communicate seamlessly with one another. The Ethernet port supports up to four protocols simultaneously so even Ethernet to Ethernet conversion may be performed. The CompactFlash card allows data logging of process data from any connected device. The USB port may be used for blazing fast file downloads, or to mount the Data Station’s CompactFlash card as an external drive to your PC. The Data Station’s DIN rail mounting saves time and panel space and snaps easily onto standard top hat (T) profile DIN rail. The DSPSX000 and DSPGT000 offers several additional features beyond those offered by the DSPLE000. The CompactFlash card allows data to be collected and stored for later review. The files are stored in simple CSV file format allowing common applications, such as Microsoft Excel and Access, to view and manage the data. The free Websync utility provides a means to synchronize the files with a PCs hard drive for permanent storage. The built-in Web server allows log files to be retrieved manually, and also provides access to the unique "virtual HMI". The virtual HMI is programmed just like Red Lion’s G3 Series of HMI. Any standard Web browser such as Internet Explorer or Netscape may be used to monitor or control the HMI from a PC anywhere in the world. Note: Comes with installation manual.